It turns out the maps you’ve used all your life don’t actually show what the world really looks like. 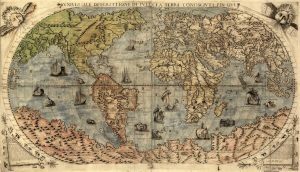 While many of us haven’t put much thought into how maps are made, it’s been debated by cartographers for centuries, and has important applications for areas such as surveying and navigation. But why the debate? Map-making sounds pretty simple – surely you can just measure the Earth and draw it, right? Well, unfortunately, it’s a little more complicated than that. A world map from 1565 (haven’t we come a long way?). Image credit: Jlr3001 via Wikimedia Commons. Mathematician Carl Friedrich Gauss proved in 1828 that the surface of a sphere cannot be transferred onto a flat surface without distortion, meaning that the largely-spherical Earth was always going to be an issue. Basically, spheres and flat surfaces are so different in terms of curvature that they can’t really be equated. If it helps, imagine placing half an orange flat-side down and jumping on top of its dome – you’re going to get a torn mess, not a nice flat circle. This means it’s difficult to accurately map the size and location of landforms onto a flat piece of paper – to get it to fit, you’ll always get some distortion in size and shape. 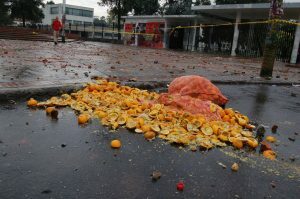 Smashed oranges do not make a good map. Image credit: Matt Lemmon via Flickr. Cartographers have been trying to develop more accurate maps for years, but no one’s quite managed it. This means we’ve got heaps of different types of map, each with their own strengths and weaknesses. Firstly, a map is the view of an area you see in an atlas – it’s a representation of what the world looks like. A map projection on the other hand is the method cartographers use to translate points on a globe onto a map. Put simply, you use a map projection to create a map. Due to the distortion issue, no map projection can replicate the Earth with 100% accuracy, and the usefulness of each depends on what you need the map for, whether it be navigation, understanding the size of landmasses, or just knowing what the world looks like. 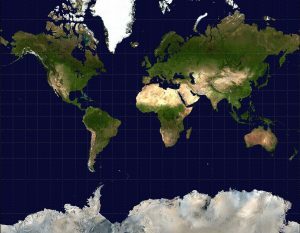 Most maps you’ll see now are based on a cylindrical projection method, where the Earth’s lines of longitude (meridians) and latitude (parallel) are converted to vertical and horizontal lines on a map. Imagine wrapping a cylinder of paper around the Earth, with a light inside that projects the outlines of landmasses onto the paper. Everything around the equator will look pretty ok, but as you get further towards the poles, the shadows will stretch further and become distorted before they hit the paper. Two common projections – the Mercator and the Gall-Peters – deal with this issue differently, and distort the map in different ways. How the Earth’s lines of longitude (meridians) and latitude (parallel) are converted to vertical and horizontal lines. Image credit: Wereon via Wikimedia Commons. A map created using the Mercator projection – the most common type of map we see. Image credit: Mdf via Wikimedia Commons. 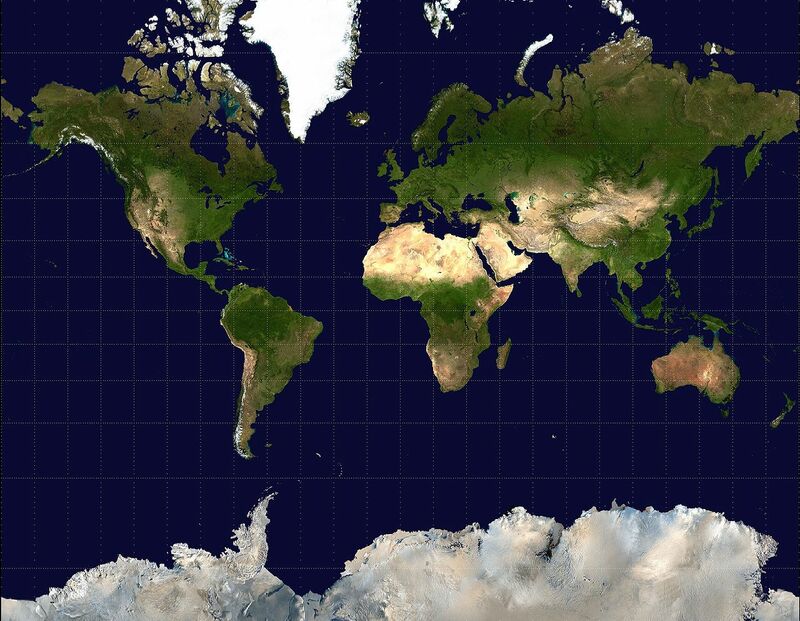 Mercator projections are great for navigation and for showing the shapes of landmasses. This projection accurately preserves angles between points, meaning that the bearings you read off the map are what you’d use in real life – they’re what you’d set on your compass. But while Mercator preserves angles and shapes, sizes get distorted as you move away from the equator. You may have heard that Greenland isn’t as big as we think it is based on maps, and this is why – we’ve got the right idea about its shape, just not its size. This also means we don’t fully appreciate how large landmasses around the equator are in comparison – and this is where the Gall-Peters projection comes in. With the Mercator projection, circles drawn on a globe keep their shape but become larger as they move away from the equator when transformed onto a map. Image credit: Stefan Kühn via Wikimedia Commons. 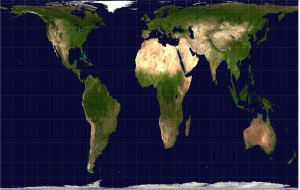 The Gall-Peters projection creates a map similar to the one we’re familiar with, but the sizes of the landforms are more accurate. Image credit: Louis Wareru and Mdf via Wikimedia Commons. The Gall-Peters method still distorts the Earth as you get further from the equator, but in a different a way. It shows the size of landforms far more accurately, but distorts the shapes and angles instead. So in this case, Greenland is the right size (quite small compared to other countries), but it’s also the wrong shape. 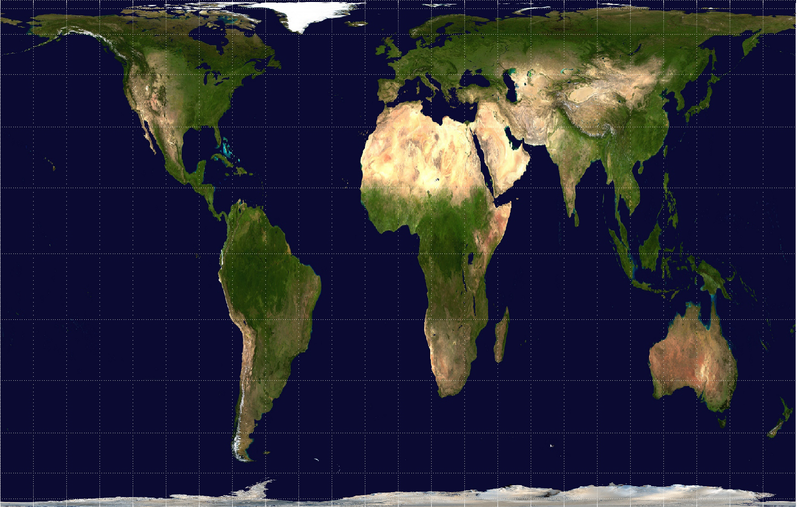 This means Gall-Peters isn’t really any more accurate than Mercator, it’s just flawed in different ways. It’s become more popular because Mercator exaggerates the size of historically imperialist powers such as Europe and North America (which happen to be further from the equator), while landmasses such as South America and Africa appear much smaller than they really are. Gall-Peters on the other hand shows continents at their correct size, but it’s only really useful for an idea of how the Earth looks – not for practical purposes such as navigation. In order to preserve the correct size of landmasses, the Gall-Peters projection distorts the shapes of circles drawn on a globe when transferring them onto a map. Image credit: Stefan Kühn via Wikimedia Commons. So what does this mean in the end? There’s no absolutely “correct” system to map our world, you just need to know what you want to use your map for before deciding on a map projection. So if you just want a rough idea of how the world looks, you’d use either Mercator or Gall-Peters, but if you’re navigating the globe in the 18th century, you’d probably want Mercator. And if you don’t use this information for anything else, all these problems with mapping our planet can at least give you a great argument to use against the next flat-Earther you come across. Enjoyed your article, there are also conic projections, Albers Equal Area Conic and the Lambert Conformal Conic projections, stereographic projections, azimuthal projections. So many inventive ways to flatten out a sphere.